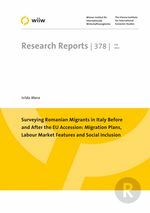 This report describes the migration patterns of Romanian migrants in Italy before and after the accession of Romania into the European Union (EU). The findings and the main results presented throughout the report were collected by carrying out a survey in three main cities of Italy: Milan, Turin and Rome which are recognized as the main destination regions of Romanians who have migrated to Italy since free visa liberalization in May 2004. The report focuses on four broad areas: the profile and migration plans of migrants, regional differences and basic characteristics; labour market patterns during the migration experience, including income and remittances; social inclusion of migrants and access to social security and the health system; and, self-assessment of the migration experience and results of moving to Italy. The survey demonstrated that the mobility of migrants during the free visa regime was initially labour supply driven, whereas more recently, it has been labour demand that moved the migrant from his/her country of origin. However, the survey points out that almost half of Romanian migrants in Italy have indefinite migration plans. The remainder of the migrants express a preference for permanent migration, followed by long-term migration, while a preference for short-term migration is the least popular. The accession of Romania to the EU was accompanied by a flow of migrants with a higher preference for permanent and long-term migration, especially among those who arrived immediately after January 2007. Half of the migrants who had defined migration plans indicated that their current migration preferences, compared to the ones they had upon arrival, have shifted towards permanent migration. This is particularly true among women. As concerns remigration, or return to Romania, the survey reveals that migrants who are more likely to return to the country of origin or move to another country are those living in Rome while migrants who prefer to remain permanently are those living in Turin. As for labour market patterns and regional differences, four-fifths of migrants are employed, with the highest share of those working full-time found in Rome, followed by Turin and Milan. Unemployment among Romanian migrants seems to be the highest in Milan and the lowest in Turin. A significant proportion of migrant women have jobs in the categories ‘Sales and services elementary job’, ‘Personal care and related workers’ and ‘Housekeeping and restaurant services’. Men mostly work as ‘Extraction and building trades workers’, ‘Drivers and mobile plant operators’ and ‘Metal, machinery and related trades workers’. A non-negligible share of migrants work without a fixed contract which makes their employment position more vulnerable and open to exploitation. In addition, the survey shows that occupational switches occurred within all categories of occupational skill levels. In particular, there has been a trend towards jobs distinguished as medium and low skilled. Moreover, a comparison between education level and occupational skill level shows that highly skilled migrants, especially men, are employed in jobs below their level of educational achievement. A concern often expressed is that migrants who have access to health and social security services are more encouraged to enter or stay in a country. However, the survey rejected this hypothesis and suggests that neither receiving social security benefits nor the availability of accessing healthcare drives migrants’ decision to enter and remain in the destination country. Access to healthcare, however, appears to have some potential effect on migration plans. We find that the longer migrants plan to stay in the country, the higher the percentage of them who have access to a general practitioner/doctor and the higher the number of them whose migration decision is affected by access to such services. Accordingly, it emerges that the length of stay in the destination country matters and it confirms that there is a correlation between the duration of stay and the effect on migration plans attributed to access to social security and health services, even though such cases represent less than one-fifth of migrants. Self-assessment of the migration experience and outcomes from moving to Italy demonstrated that overall most of Romanian migrants are happy with their migration experience in Italy. The self-assessment indicated ‘making more money’, ‘finding a better job’ and ‘learning a new language’ as the main positive outcomes from the migration experience. In contrast, ‘insecurity about the future’, ‘discrimination’, ‘negative impact on family relationships’ and ‘doing work under the level of qualification’ are listed among the main negative outcomes.